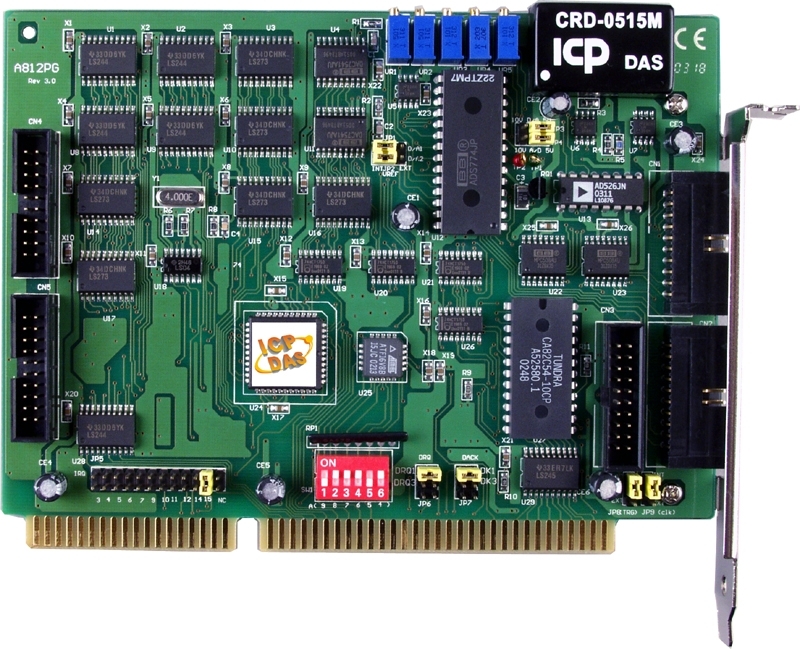 The A-812PG is 12-bit multifunction analog and digital I/O boards for the PC/AT compatible computer. The A-812PG offer 16 single-ended plus two channels of analog output with 12-bit resolution. In addition, The A-812PG has 16 digital input, 16 digital output , and one timer/counter channel. The A-812PG Provides gain of 1, 2, 4 , 8 , 16. It has a maximum sampling rate of 62.5 k Samples/Sec., DMA operation is jumper selectable for levels 1 or 3. Interrupts are jumper selectable between 3 and 15. ICP DAS discontinue the /NDA model (without D/A function) since the standard model provides full functions that covers the requirement for /NDA version. Please contacts us for OEM/ODM project if you are interested on customized version (or /NDA model). Sampling Rate 62.5 kS/s. max. Output Impedance 0.1 Ω max. Input Voltage Logic 0: 0.8 V max. Logic 1: 2.0 V min. Output Voltage Logic 0: 0.4 V max. Logic 1: 2.4 V min. Input Frequency 10 MHz max. CA-2020 20-pin flat cable 2 M.